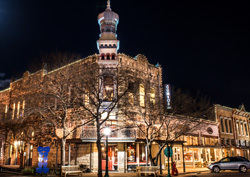 This is the iconic and historic Old Masonic Lodge Building on the historic Courthouse Square, in vibrant and beautifully restored downtown Georgetown, Texas. This is a Class A 3-storey commercial structure that features restaurant, lounge and banquet facilities on the first and second floors, and professional executive office space on the third floor. Call now for a private viewing at the number below! 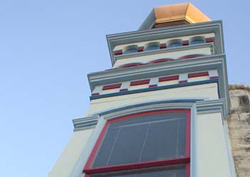 The Old Masonic Lodge is a spectacular landmark building located on Georgetown’s historic courthouse Square. 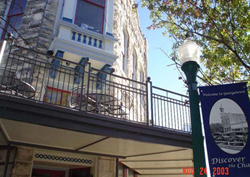 It is among the largest, most historic, and most prominent commercial properties on the historic downtown courthouse Square. It is the tallest building directly on the downtown Square, and is only one of a very few that offer professional office space. 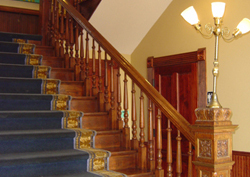 This graceful and dignified historic landmark was built in 1900, and completely renovated in 2003. 118 years old, the building is grand and stately, and since it’s 2003 renovation, it also boasts 21st Century infrastructure, such as modern elevators, ADA compliancy and blisteringly fast fiber-optic broadband capability. This is a 118 year-old hand-crafted cut stone historic building listed in the National Register of Historic Places. 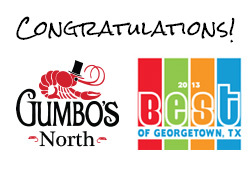 Few restaurants or working professionals really need to be in located in such an extraordinary space. But some business concepts really benefit from it. 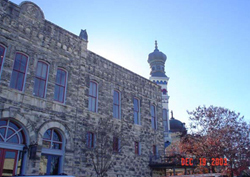 With its storied history, its iconic status in Georgetown, it’s distinctive onion dome, cut stone arches, marble lobby and solid oak finishings, the Old Masonic Lodge Building is an amazing place to work to work and play. 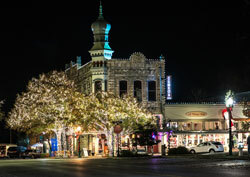 With a plethora of great dining options on the Square, working in downtown Georgetown offers a magical quality of life. If you want to escape from the drudgery of fluorescent bulbs, office cubicles, strip malls and business parks, working on the Square is utterly invigorating and refreshing. 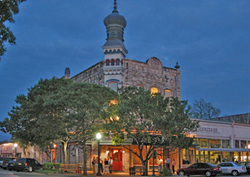 Here we offer zest, culture, and the stimulation of a vibrant small-town downtown. Work and play in the energy and vitality of a bustling business district. We offer walking-distance access to banks, coffee shops, restaurants, fine retail, pastries, title companies, beauty salons, government offices, and the county courthouse. There is just about always something interesting going on downtown. If your concept will do just fine in a strip mall — we’re sure you’ll find something suitable to your needs elsewhere. But if you need the timeless grace and authentic splendor of this magnificent structure to convey, augment and support your business concept and brand, welcome home! Please call the number below to schedule a private tour! Besides the county courthouse across the street, this is probably the most photographed building in Williamson County, so there is a high likelihood you’ve seen us in area magazines, pamphlets, advertisements — even logos. And if you were a fan of NBC’s Friday Night Lights, you may recognize us from Season 5 (the first floor was transformed into a “New England” restaurant). 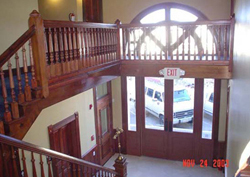 More recently, scenes from Richard Linklater’s film Bernie were filmed on our 3rd Floor (3rd Floor offices were transformed into the Sheriffs office and the Chamber of Commerce office). 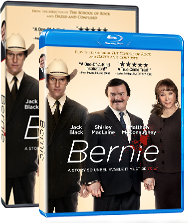 Bernie starred Jack Black, Shirley MacLaine and Matthew McConaughey, and was released in 2012. We’re trying to keep track. 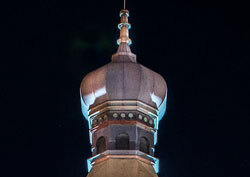 Check out our In the Media gallery for all the cameo appearances the building has had in recent years! What’s so special about Williamson County? 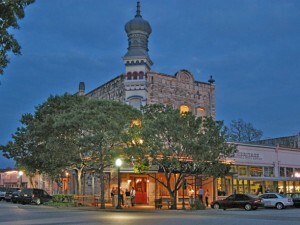 The Old Masonic Lodge Building, Main and 7th Streets, downtown Georgetown, Texas. 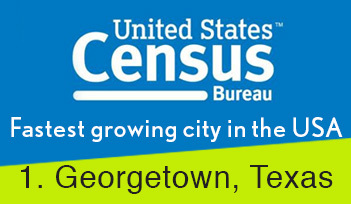 Williamson County is the fastest growing part of the Austin/Georgetown, Texas Metropolitan Area. It’s been booming here in recent years, with so much business growth and momentum it is consistently ranked among the fastest growing counties in the United States. Even now — in the midst of a national economic slowdown — Williamson County is still way ahead of the pack. 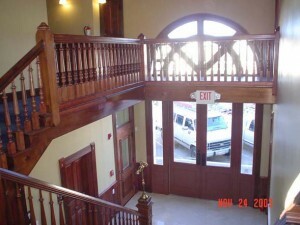 We invite you to consider the possibilities of locating your appropriate business concept to to the Old Masonic Lodge Building in Georgetown, Texas. Please call 512.633.2961 to arrange for a private viewing! Call 512.633.2961 for more information! 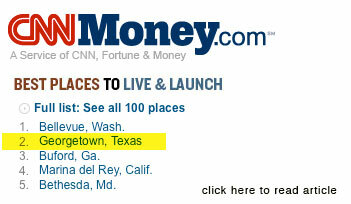 We made the top of the list!